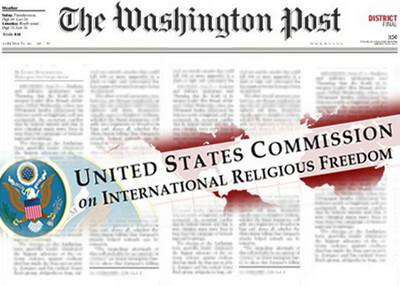 The U.S. Commission on International Religious Freedom has spent more than a decade advocating the rights of millions of religious minorities from Sudan to Iran and Switzerland. But you'd never know it from a recent Washington Post article on the Commission's work. "rife, behind the scenes, with ideology and tribalism, with commissioners focusing on pet projects that are often based on their own religious background." The Commission's record contradicts this and shows the organization has dedicated itself to fulfilling its Congressional mandate —"monitor[ing] the status of freedom of thought, conscience, and religious or belief abroad, as defined by the Universal Declaration of Human Rights." The article, "Agency That Monitors Religious Freedom Abroad Accused of Bias," refers to the suit brought by former MPAC Director of Government Relations, Safiya Ghori-Ahmad. In her complaint, which remains sealed under law, the Post reports that Ghori-Ahmad alleges that she was fired because of her religious beliefs and employment with MPAC. While we will leave administrative law judges to decide the merits of Ghori-Ahmad's claims, to ignore both the excellent work of the Commission and the background of the complaining employee would be a mistake. "I think the language that's being used is extremely problematic. These hearings are called: 'Violent Islamic Radicalization,' 'Violent Islamist Jihadization.' You are pushing people away from dialogue and discussion by language like that, because you're equating violence and terrorism with our religion. Just like other religions, there are bad people carrying out acts of violence in the name of their religion…we don't ascribe to those beliefs, but immediately are linked." These statements fit in neatly with MPAC's well-documented argument that U.S. actions aimed at Muslim Americans are part of a broader "war against Islam." More than simply ignoring the background of the chief complainant, the article passes over the Commission's incredibly valuable work. Created by Congress in 1998 as part of the International Religious Freedom Act, the Commission currently has nine members, including two Catholics, two evangelical Protestants, one Southern Baptist, one Orthodox Christian, one Jew and one Muslim. This diverse group of commissioners has taken their mission seriously, repeatedly speaking out on behalf of religious minorities everywhere—regardless of either the victim or the perpetrator. In a December 19, 2000 press release the Commission wrote to then-Secretary of State Madeline K. Albright urging the US to denounce the targeting of holy places of any religion in Israel and the Palestinian territories, and to condemn those who call for violence in the name of religion. The piece was critical not just of attacks against synagogues and churches, but also against mosques. This was one of the earliest examples of the Commission speaking out on behalf of Muslims, but it was not the last. "The Pakistani government commits abuses in the form of laws violating the rights of the Ahmadis, a minority community of heterodox Muslims, the persistent sectarian violence targeting Shi'ite Muslims, Hindus, Christians, and Ahmadis and the Hudood ordinances, which violate the rights of women in Pakistan." " Khartoum's military forces and the Khartoum-sponsored 'Janjaweed' militia have employed in Darfur the same genocidal tactics first used in the South against Christians, followers of traditional African religions, and Muslims who opposed Khartoum's attempts to impose Islamic law on them." "[m]inority communities including Christians, Yazidis and Sabean Mandaeans, have been forces to fend for themselves, and are particularly vulnerable given their lack of a tribal or militia structure to provide for their security." In a 2006 editorial in the Washington Post discussing the Iranian regime, Commission staff argued that "religious minorities—including Jews, Christians, Sunni and Sufi Muslims, Bahais, dissident Shiite Muslims and Zoroastrians—faced systematic harassment, discrimination, imprisonment, torture, and even execution because of their religious beliefs." "it is unfortunate that, in the absence of actual evidence of a legitimate threat to public order, France and the European Court of Human Rights have interpreted a general notion of secularism so radically that it has trumped religious belief. Secularism does not mandate a ban on peaceful individual religious expression, including the decision to wear religious articles that other believers or non-believers may associate with religious extremism." While this list is no way exhaustive, it is demonstrative of the work that the Commission has spent the past decade performing. Yet none of these efforts made their way into the pages of the Washington Post last week. Instead, the newspaper chose to highlight two other acts of the Commission's work—misrepresenting one and glossing over the importance of the other. "The atmospherics surrounding passage of the initiative were marked by appalling demonstrations of bigotry, and this, when coupled with the fact that it institutes an outright ban directed only at Muslims, raises serious questions about how the initiative may contribute to suppressing freedom of religion and discriminating against Muslims on account of their beliefs." Similarly, in its recent article. the Post reported on the Commission's criticisms of the Islamic Saudi Academy in Northern Virginia, asking if it was a "legitimate international issue or an example of anti-Muslim bias?" That question, whether it's "an example of anti-Muslim bias," seems to imply that there is only one form of Islam and that any criticism of it is an assault on all Muslims. The Commission did not advocate that the Islamic Saudi Academy offer a secular curriculum only, rather it sought to purge references from educational materials that seemed to sanction killing infidels and apostates. "Several studies, including by Saudi experts themselves, have pointed to serious concerns that these texts encourage violence towards others, and misguide the pupils into believing that in order to safeguard their own religion, they must violently repress and even physically eliminate the "other." "A twelfth grade Tawhid (monotheism) textbook states that 'major polytheism makes blood and wealth permissible,' which in Islamic legal terms means that a Muslim can take the life and property of someone believed to be guilty of this alleged transgression with impunity. Under the Saudi interpretation of Islam, 'major polytheists' include Shi'a and Sufi Muslims, who visit the shrines of their saints to act for intercession with God on their behal, as well as Christians, Jews, Hindus, and Buddhists." While reporting the criticism, the Post glossed over the importance of these steps. Shouldn't the U.S. government do everything it can to ensure that radical Islamic theology is not being pushed on American children? Doesn't the American-Muslim community have an interest in these efforts? Ghori-Ahmad and her gaggle of critics of the Commission may not be satisfied that the group isn't spending all of its time attacking the State of Israel and the United States for their perceived wrongdoings, but that does not amount to a failure to protect the rights of Muslims or other religious minorities. As Chairman Leonard Leo explained, "I don't know of any other organization who defends as many Muslims in the world as we do." The critics have not proved otherwise.